AMADEO is one of the neurological rehabilitation devices from the TYROSOLUTION by TYROMOTION. 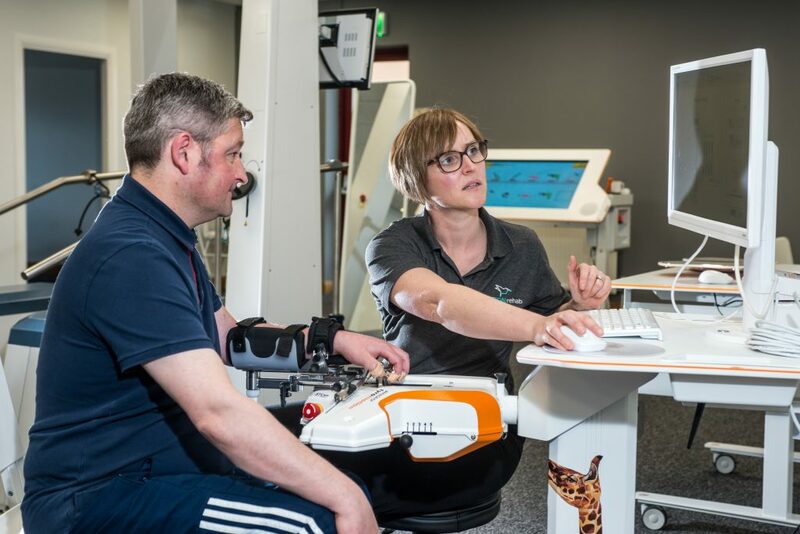 MOTIONrehab is unique as it is the only rehabilitation company in the UK to have the whole TYROSOLUTION under one roof, enabling high-intensity rehabilitation for all phases of neurological rehabilitation. AMADEO is specifically designed for rehabilitation of the hand, fingers and thumb. It has the unique ability to achieve a high intensive repetition of hand movement to work on the flexibility of your joints and muscles and help regain movement in your hand following a Stroke, Spinal Cord Injury, Head Injury or other Neurological Conditions. The AMADEO can be used for both adults and children and it can target your whole hand or individual fingers. 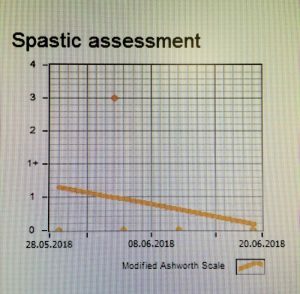 Reduction in muscle tone using the MAS and 3 weeks of AMADEO. This is translating into functional goal. The client is now using a knife and fork to eat about a third of her meals independently. AMADEO is a rehabilitation robot that can be used in all phases of neurological rehabilitation. This means even if you are in the early stages of your recovery or if your illness/injury was several years ago AMADEO could help. AMADEO is able to help you if you have limited movement in your fingers or whole hand. Therapy with AMADEO can help improve both the motor and sensory functions of your hand and fingers. Therapy programs are tailored to your individual needs. Your therapist can choose passive, supportive and active exercises and tasks, depending on the progress made during the course of therapy. AMADEO improves the movement and the strength of your fingers and/or hand. It also helps to reduce spasticity. Therefore, allowing you to regain the natural freedom of movement of your hands. Those who have used the AMADEO tell us the varied training and clearly structured feedback is motivating and helps them to reach their full potential. MOTIONrehab’s Intensive Rehabilitation Programmes includes 80 hours of neurological rehabilitation over 4-7 weeks dependant on the outcome of the initial assessment. MOTIONrehab recognises that everybody is different and may come to MOTIONrehab at different and stages of their rehabilitation. Therefore, MOTIONrehab have three high-intensity rehabilitation options and you will be advised which is the most clinically appropriate.